Joining the foursome on their trip to Siberia to track down a cosmic weapon are Katana, the Enchantress, and Killer Croc. While I like these characters to varying degrees we don't get enough of any of them to get a great idea yet of what this comic will look like. 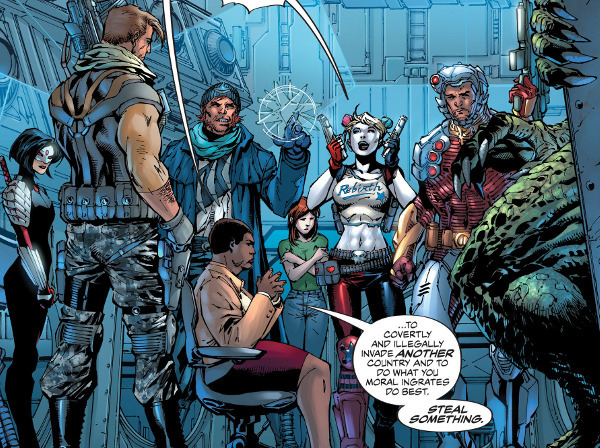 Narrated by Amanda Waller, Suicide Squad #1 goes over the basics of these characters and the Task Force X set-up for new readers before dropping the characters into their first mission which goes wrong before they even land in Russia. Mostly just preamble for the story yet to come, it's too early to judge how well this new team will work together just yet. For fans.